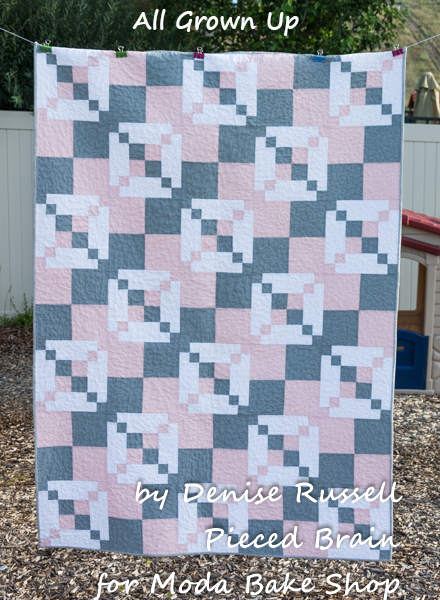 I can finally show you the quilt I had been working on for Moda Bake Shop! I had a lot of fun designing, piecing, and quilting it. All Grown Up, going from small 4-patches, to medium and then larger 4-patches... the growing patches symbolize the coming of age of little girls (or boys, just change the colors). Moda fabrics are so easy to work with! Very little fraying, soft hand, and Bella Solids have such amazing colors! 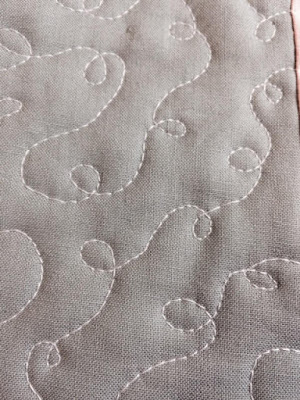 This pattern would look great in a number of color trios. The free tutorial is very detailed with pictures and diagrams to make it easy for you to make your own beauty. I pieced it and quilted it using Aurifil 50wt. This thread weight was perfect for the quilt, lending it a soft, delicate touch. I am so happy with the results! So, if you are looking for a new project, head over to Moda Bake Shop and download the pattern. Pick Bella Solids colors that speak to you, and get quilting! Denise, it's adorable. A very clever design! It's definitely going on my 'to do' list! Thanks so much! It's beautiful. I love the colors that go so perfectly with the design. I'm not usually a fan of Irish Chain patterns, but I love this one, Awesome quilt!